Huawei had a rather silent CES this year, with no new announcements, but they did display their latest range of smartphones. Huawei has had their own share of success in the past and were placed at No.3 in the smartphone manufacturers ranking before being replaced by Xiaomi. 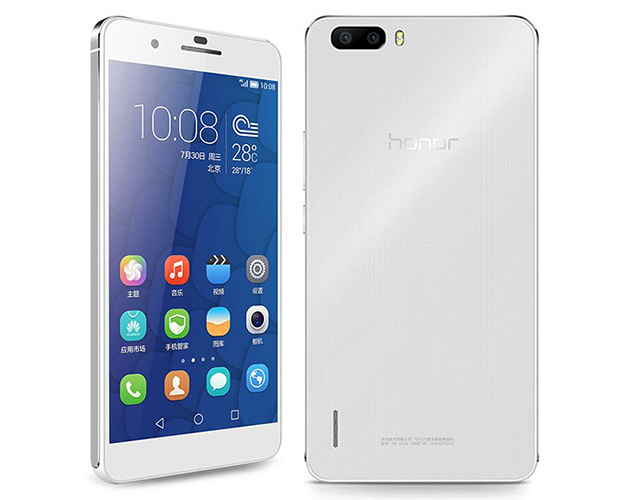 That has not stopped Huawei from giving us some very strong devices , and one of them is the new Huawei Honor 6 PLUS. The name may sound familiar ( iPhone 6 Plus), but trust me, the two devices are nothing alike. The Honor 6 Plus made its debut last month, but it did make an appearance at the CES. Lets take a look at what the Honor 6 Plus packs. The Design is not what you would call premium, and is definitely, not a selling point for this device. The material used is not premium quality, but if phone design doesn’t matter, you may ignore this point . The device supports 2G, 3G and 4G connectivity, with a Dual Sim option. The micro SD slot doubles as a SIM slot if you ever need to use another SIM. So, connectivity standard has matched the current industry standard. Lets move on. Display – The Honor 6 Plus features a 5.5 inch 1080p Full HD display. The pixel density clocks in at 401 ppi, which is enough to give you decent viewing angles, punchy colours and some crisp text output. The UI software is Huawei’s in house Emotion UI 3.0. The UI section of huawei has been something of a “good but not the Best” in the past, but looks like they have added a few improvements to this new version, and we will have to see how this UI pans out once the phone settles down in the market. Performance – The Huawei lineup has always featured their home baked HiSilicon Kirin, a chipset which has received mixed reviews world wide. The Honor 6 Plus features the new HiSilicon Kirin 925 chipset. The 925 chipset features a Quad core 1.8 GHz Cortex A-15 process and a Quad core 1.3 GHz Cortex A-7 processor. The specs sound solid, but exactly how it will perform against the likes of the Snapdragon and the MediaTek remains to be seen. The Device boots Android 4.4.2 KitKat OS with an upgrade to 5.0 Lollipop in the works. Memory – We get two variants of the Honor 6 Plus – A 3G model which comes with 16 GB internal memory, and an LTE model with 16/ 32 GB internal memory. Both variants come with a staggering 3 GB RAM. The memory expansion slot can host upto 128 GB of external memory. The Sd slot can also house an additional SIM card should you ever find the need to use one if you go abroad or out station. Overall, a pretty strong memory package, and the 3 GB RAM will really attract the performance seekers. Camera – The Honor 6 Plus feature an 8 MP Dual rear camera. The Dual camera was seen last in the HTC One M8, where one camera sensor acted as the main camera, while the second acted as a depth sensor. Its the same in the Honor 6 Plus. The rear camera package also features dual LED flash. The front camera, aka “selfie camera also features a sleek 8MP sensor, so there is something to rejoice for the Selfie fanatics. We can record 1080p videos @ 30 fps through with, the front and rear cameras. So, even the camera package has put up a pretty strong performance. The FM radio and the IR port also make an appearance in this device. The IR port is growing ever popular and is now a must have feature for almost every smartphone user. The inclusion of the IR port in this device will surely put it in the bracket of the devices that have the feature, a list which is not very populated right now. Battery – The Honor 6 Plus features a very strong 3600 mAh battery. This battery will give you more than a day’s worth of usage easily, and if you are the conservative user, you could stretch the phone to get even more usage time on a single charge. All in all , the Honor 6 Plus may not be the best looking phone out there but that doesn’t mean it doesn’t perform. Huawei is looking to get their Mojo back and the new lineup of devices are aimed to achieve just that.